Bruins’ Senyshyn Seny-shines in NHL Debut! So, what SHOULD folks know about the B’s prized prospect both lauded & lamented simultaneously for what he’s never done yet and still yet to do in a Black N’ Gold sweater? Bruce Cassidy prescribes rest for a handful of Bruins to make sure they’re as fresh as possible for next week’s playoff series v Toronto. Jaro Halak goes in goal, #19 Zach Senyshyn makes his debut.
.@ZachSenyshyn is on the ice in Minnesota. And in the hallowed hockey history of memorable Bruins’ debuts, I’d call Senyshyn’s nothing to shun. In fact, he shined in the limited but productive ice time he was given by head coach Bruce Cassidy. So, what does the future hold for a young man who now holds a more impressive one-game statistical resume than a certain other notable ’15 draftee, sarcasm set aside so we can slyly celebrate before reality sets in? I bet we’re all hoping for something surreal… something that reminds us of other talented & promising B’s prospects who matured late and blossomed in the spoked-B despite the hate, hype & hyperbole directed their way before they even played an NHL game. I know Senyshyn’s teammates are already tickled pink for their baby-faced brother, as you can see from their smiles & sentiments on the ice & off (himself included)! It’s reassuring to know he, too, is taking it all in stride, with laughter, graciousness & gratitude at the forefront of a hockey skillset and mindset just waiting for even more chances to Seny-shine in Boston. Bruins Clinch Home Ice Advantage-Time To Rest? 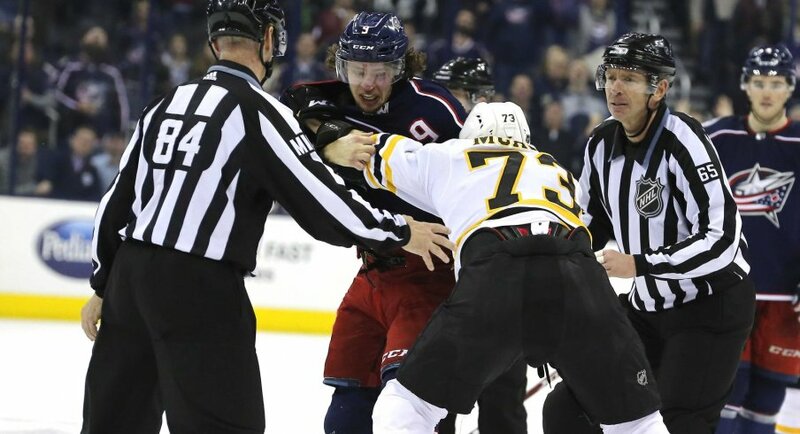 By virtue of their 6-2 victory over the Columbus Blue Jackets on Tuesday night at Nationwide Arena, the Boston Bruins have secured second place in the NHL’s Atlantic Division and more importantly, home ice advantage in their opening round playoff series against their division rival, the Toronto Maple Leafs. The Bruins were led by winger Jake DeBrusk’s three-point game and Brad Marchand’s two-point night, becoming Boston’s first 100-point player since Joe Thornton in the 2002-03 season. The six-goal outburst was hi-lighted by balanced scoring with goals coming from three of the four lines. The Bruins victory coupled by Toronto’s 4-1 defeat on home ice to the Carolina Hurricanes wrapped up second place in the Atlantic Division for the Bruins and guarantees they will open at TD Garden against the Leafs when the NHL playoffs begin in just over a week. For the second straight season, the @NHLBruins and @MapleLeafs have a date in the #StanleyCup Playoffs. It all starts on April 10th. The significance of clinching home ice with two games to spare should not be overlooked. Coach Bruce Cassidy now has the luxury of resting some of his key players who may be nursing minor injuries that players often deal with having reached game 80 in the regular season schedule. Look for Cassidy to deploy some unfamiliar looking line-ups over the final two regular-season games against Minnesota and Tampa Bay. For a change, this is a luxury situation and not a crisis caused by the injury bug. The question becomes which Bruins are in line for a game off over the last two? Coach Cassidy will attempt to balance health and rest with keeping players playing well and not disturbing chemistry. Zdeno Chara: The 42-year old Chara will be relied upon heavily against the Maple Leafs in a shutdown role most likely against the Auston Matthews line, as well as on the penalty kill. Having suffered a knee injury in Colorado back in November, Chara has only appeared in 61 games this season, low by his standards, but the opportunity for a night off to refresh and recharge for the playoffs makes perfect sense. Charlie McAvoy: McAvoy has had a good season and has been especially solid over the last 25 games or so for the Bruins while earning seen key situational ice time including an increased role on the first power play unit while Torey Krug was out of the lineup. Brandon Carlo: The third-year defenseman has blossomed this season and is having the best campaign of his young career. Carlo has become a key defender and is being deployed in matchup situations as well as on the penalty kill. Bruins fans are all too familiar with the devastating season-ending injuries Carlo has suffered in each of his first two seasons. After compiling relatively injury free seasons, Carlo was lost in the final regular-season game two years ago and missed the entire 6-game playoff series against the Ottawa Senators. Last season, Carlo went down with just over a week remaining in the regular season and missed the entire playoffs yet again. The Bruins would be wise to sit Carlo for the final regular season game and have him wrapped in cotton balls in the press box for good measure! The remaining key Bruins defenders, namely Torey Krug, Matt Grzelcyk, and Kevan Miller have all recently returned from injury. Provided all are now fully healthy and wouldn’t stand to benefit from a game off, are likely best suited to play the final two games to continue getting back into game fitness heading into the playoffs. Patrice Bergeron: Bergeron is on the cusp of cracking the 80-point mark for the first time in his illustrious career. Whilst it would be nice to reach that mark, Bergeron being the consummate professional would likely value the opportunity to rest prior to going to battle with their bitter divisional foes next week. Brad Marchand: Marchand is an interesting option and likely gets a game off as well. It would have been really interesting to see what approach Coach Cassidy and the Bruins might have taken in the final game of the season if Marchand was sitting on 98 or 99 points. Whilst the team certainly comes first it would have been difficult to deny a player the opportunity to achieve such a huge personal milestone, one that has only be seen in black and gold twice in the last 25 years. Needless to day, Marchand reaching the 100-point mark with two games remaining in the regular season makes the decision a much easier one. There is the slim opportunity to reach 40 goals (Marchand would need 4 over the last 2 games) or 100 penalty minutes (Marchand would also require 4 over the last two games), but milestones aside, sitting one of the final two games is a good bet. David Pastrnak: Having missed 16 games in the second half of the season with a broken thumb, Pastrnak should be relatively refreshed heading into the playoffs. That said, if there are any ill effects of the injury still being felt, the opportunity is there to give Pastrnak a game or two off heading into the weekend. David Krejci: Krejci is the only Bruin to have played in all 80 games this season and has probably earned the right to make his own call as to whether he sits a game in the final two or not. Krejci has had an outstanding season and is expected to be a key contributor against Toronto in round one. Krejci has an opportunity to establish a career high in points, needing just two in the final two games to match his high of 73 points achieved all the way back in 2008-09. As for the others, the opportunity is there for Coach Cassidy to sit any players who may be dealing with minor, undisclosed injuries over the final two games of the regular season. The Bruins have gotten the job done, securing home ice advantage, which has proven pivotal against Toronto in their two previous meetings, both decided in Game 7 on TD Garden ice. The rest that may be given out over the final two games has certainly been earned. 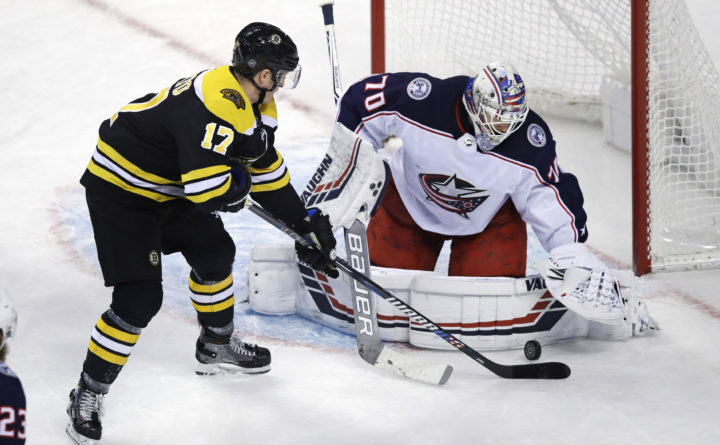 The Bruins continue their road trip when they visit the Nationwide Arena as they face the Columbus Blue Jackets, who are looking to clinch a playoff berth with a win tonight. Meanwhile Boston can clinch second place in the Atlantic Division; they are four points ahead of Toronto. After tonight’s game, the B’s will have two more left in the regular season before facing the Maple Leafs in the first round of the Playoffs. Boston will hopefully bounce back tonight as they are 1-3 in their last four games. Columbus have won five straight games and are looking to win their sixth tonight. Meanwhile, the Bruins are hoping to clinch home ice advantage if they win against the Jackets. It will be their third and final meeting with Columbus winning 7-4 in their first tilt and Boston winning 2-1 back at the Garden on March 16th. After dropping two in a row, the Bruins are hoping to bring their energy in the Arena in what hopes to be a hue Playoff atmosphere. Brad Marchand was named NHL’s Third Star of the Month for March as he is two points away from a career high of 100 points. This month alone he has tallied 23 points with nine goals and 14 assists. He recently set a franchise mark for most shorthanded goals after scoring off a sick feed from linemate Patrice Bergeron in this past Sunday’s tilt against the Detroit Red Wings. Expect Tuukka Rask in net tonight. The Bruins are 47-23-9, while Columbus is 45-30-4. Marchand leads the team with 98 points and in assists (63). David Pastrnak leads the team with 36 goals. The John Tortorella-lead team has surged lately, with the power trio of Matt Duchene, Artemi Panarin and Cam Atkinson. Panarin leads the team in points (83) and in assists (56). Columbus is in the wild-card with 94 points and could clinch a spot tonight with a win over the B’s. They are currently one point ahead of Carolina and two over the Montreal Canadiens. Expect goaltender Sergei Bobrovsky in net. The Jackets have outscored their opponents 24-4 in their last fie games. The Bruins have been hurt all year. You’d be hard pressed to recall a game in which their regular roster was 100% healthy. If you can in fact recall such a game off the top of your head, then you are likely someone with a strangely strong memory who would probably weird me out if we were to meet in person. The point is, these games have been few and far between. No one position in the lineup has been immune to these injuries. The list of injured Bruins players includes… well, just about everyone. Big ups to David Krejci for not only staying healthy all year, but for staying positive when all his friends were licking their wounds and putting band-aids on their boo-boos. But as we approach the playoffs, an area that draws significant focus in terms of game management and recovery for players is the defensive unit of the Bruins. The man-games lost to injury among Bruins defensemen alone has been astounding. So much so that I used the word astounding just now, and I took a vow to never use that word without just cause. At the tail end of a pretty significant stretch of games where the Black and Gold have been undermanned at the defensive position, things are starting to look hopeful at the right time. Torey Krug, Matt Grzelcyk, and Kevan Miller are all rejoining the Bruins’ lineup within one week of each other. Undoubtedly, some rust is to be expected out of these three as they return (Krug only had 2 assists in his return from injury, yuck). But on the whole, the Bruins will be a much better and more well-rounded team with half of their regular defensive unit back in action. A dilemma that Bruce Cassidy might be faced with, however, is how to treat the other half of the defensive unit. This would be the half that has helped keep the team afloat when a weaker team might have folded. This is the half that has been tasked with playing significant minutes in the absence of their compatriots, in order to minimize the amount of pressure and responsibility placed on the defenseman mitigate the negative affects of a beaten up D-core replete with AHL callus and press box regulars. Specifically, it will be interesting to see how Cassidy will handle the playing time and workloads of Charlie McAvoy, Zdeno Chara, and perhaps most importantly Brandon Carlo over the final five regular season games. Chara is 42, and despite being in remarkable physical condition, some rest might be crucial to entering the postseason in top form. Carlo has been solid all year long, yet went down in the later part of the regular season last year, and his absence was more than noticeable against Tampa Bay. McAvoy, despite being relatively healthy for at least the latter half of this season, has been tasked with shouldering the load as far as ice time is concerned, averaging around 23 minutes throughout each of his past five games. Logged over 11 minutes of 5v5 TOI against Landeskog-MacKinnon-Rantanen line — Boston held a 9-7 edge in SOG during that stretch. He’s hitting his stride at the perfect time. Unfortunately, there McAvoy struggled in the third period of a game against Tampa Bay on March 25th, a result that could very well be linked to fatigue and overuse (McAvoy played nearly 27 minutes in that game). All this to say, the balance between effective rest and harmful idleness is one that Cassidy will have to find for the three aforementioned D-men. Certainly any coach would like to rest the legs of those on whom he will have to rely in the playoffs (as well as protect them from injury), but it is important to keep them fresh and primed as the postseason approaches. This balance is one that is going to have to be found by calculating the right amount of minutes per night for each of the defensemen, as well as how many games they will actually dress for. What does coach Cam do? If it were up to me (and it won’t be), I would play all 6 of my regular defensemen in the final game of the season. Sure, this game comes against Tampa, whose run-and-gun style is one that could potentially place some stress on the Bruins defensively. While this might factor into a potential decision to use the game as a rest for some of the B’s defensemen, I would leave them all in. Toronto is a lock for the Bruins as a first round matchup, and the closest thing that resembles the star-power the Bruins defensemen will be facing in the first round is the star power of Tampa’s forwards in Point, Kucherov, and Stamkos. For the four games leading up to the (regular) season finale, I think it would be wise to play Miller, Grzelcyk, and Krug as much as possible. Conversely, Bruce Cassidy would be wise to allot 3 games to Chara, McAvoy, and Carlo as the season comes to a close. Apart from the final game, find two others for each defenseman to skate in, and have Connor Clifton and Steven Kampfer fill in as needed. If all goes well, maybe John Moore will even be healthy by the time playoffs roll around. Torey Krug low key led all Bruins skaters with 22:12 TOI. Not bad for a first outing back. This is all speculation and opinion from someone who writes with more confidence than he ever played hockey with. But to me, it seems pretty clear that the Bruins D-core could benefit from some balance and rest as the season comes to a close, so that they are not decimated by injuries as was the case at the heartbreaking end of last season. Don’t worry. I’ll have my guy talk to Butch. They text a lot. With three assists in Boston’s 6-3 defeat of the New York Rangers at TD Garden on Wednesday night, Bruins winger Brad Marchand has moved to 97 points on the season and now has his sights firmly set on becoming the first Bruins player to hit that milestone since Joe Thornton had 101 points in the 2002-03 season. With five games remaining it remains to be seen if Marchand will join Joe Thornton as the only 100-point Bruins in the last quarter century. Prior to Thornton, the last Bruin to eclipse the century mark was Adam Oates in the 1993-94 season with a 112 point effort. It would be in Marchand’s best interest to bank the remaining three points he needs as quickly as possible as Head Coach Bruce Cassidy will likely be looking to rest many of his star players in the regular season’s final couple of games. A look ahead to the Bruins final game of the season, at home against the President Trophy winning Tampa Bay Lightning on April 6th is one that could see both teams sit a number of regulars in preparation for their respective first-round playoff matchups. The Bruins are closing in on 2nd place in the Atlantic Division (and home ice advantage in the first round) with a 6-point lead on the Toronto Maple Leafs with only 5 games to play for each club. The evolution of Brad Marchand has been an amazing ride for the Boston Bruins and their fans over the past decade. A third round (71st overall) draft pick in 2006, Marchand has evolved into one of the elite players in the game. It hasn’t always been easy, his agitating style and propensity for playing on the edge has meant that it has taken a long time for Marchand to earn the respect of officials, opposing players and coaches, hockey media, and opposition fan bases, the latter of which remains in question. There is no doubt, however, that his game has reached a level that warrants mention among the elite players in the game today. As he puts the finishing touches on leading his club in scoring for the third consecutive season and fourth time in his career, the focus will be on continuing to play the game right, remaining fresh and healthy, and avoiding any run-ins with the NHL Department of Player Safety that could de-rail his opportunity to become a 100-point player in the league. Bruins fans will recall that two seasons ago, Marchand was on the cusp of achieving a significant personal milestone and becoming a 40-goal scorer in the NHL when he speared Tampa Bay’s Jake Dotchin in game 80 of the regular season. Marchand was suspended for the final two games of the regular season and finished on 39 goals for the campaign. If anything good has come out of past indiscretions, it may be that Marchand has finally matured into an elite NHL winger who can play on the edge when needed but increasingly has the ability to skate away from the trouble that dogged him so much earlier in his career. Whether Marchand reaches the 100-point mark or not remains to be seen over the next five games, but there is no question about how valuable a player Marchand has become for the Boston Bruins. Fans will be cheering hard for one of their favorites to achieve this milestone but at the same time realize that preservation and preparation for the playoffs is going to be paramount over the final week and a half of the regular season. Brad Marchand is more than likely going to hit 100 points for the first time in his career and no one outside of Boston seems to talk about it. Entering the 2018-19 NHL season, just 109 players in league history had scored 100 or more points in a season, and only 9 members of the Bruins had achieved the feat. Brad Marchand will have the opportunity to join those exclusive lists while eyeing a more significant goal, a deep playoff run and a march toward his second Stanley Cup championship.